That looks like a neat tie. I can't open up the picture from the email, but it looks like one of those old fashioned Disney ties. 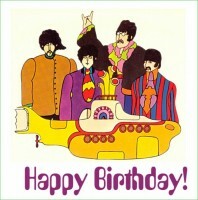 Here's to hoping Beatlebug gets her wish. I'm pretty pumped to rock those Beatley ties when I get home. Monday: We had a missionary breakfast in Billings. We spent most of the day at the stake center. In the afternoon members came and set up a Christmas Eve dodge ball game. In the evening we had dinner at a members house and then afterwards we read "Twas The Night Before Christmas". Tuesday: We woke up and got ready and headed over to the church to Skype our families. We did that for the better part of the morning. We had lunch and dinner with members and then we were approved to watch the movie the Polar Express anytime between the 24th and the 27th, so we did that. Wednesday: The day after Christmas was back to business as usual. We had district council in the morning. In the afternoon we went contacting at a store called Scheels. Later on we went shacting, which is as a word a mix between shoveling and tracting. We basically went around and shoveled random people's walkways. Thursday: We had interviews with our mission president which went until about 1ish. After that we went and tried to contact some people around in Laurel. Friday: We spent the day walking around and contacting people. We also did some more shacting. In the evening we helped a member skin a goat, then we ate the goat. Saturday: We did pretty much the same thing we did friday during the day. In the evening we played basketball with the ward members. Sunday: We had church, the last 3 hour block ever. After that we did even more shacting into the evening. 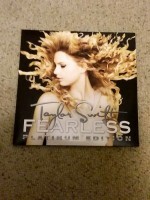 At some point in the week we went to Walmart and they were playing Eight Days A Week . Also here's a couple of presents I got that weren't sent up to me. 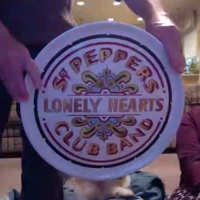 One is a 13" (I believe) Sgt Pepper plate. 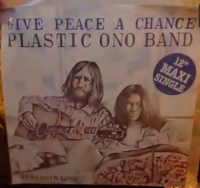 The other is a John Lennon "Give Peace A Chance " Maxi Single. The pictures are screenshots taken over Skype so that's why they aren't super clear. There's also another present that is still wrapped back home. 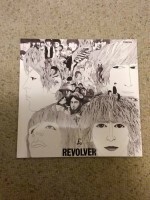 I "don't know what it is", but I'm over 99% sure that it is the White Album 50th anniversary super deluxe box. That's something to look forward to when I get home. I'll spare you all the pictures of the goat being skinned since there are those who are probably a bit sensitive to that. However if you would like to see them I'll send them. Transfer news is in, and I will be staying and my two companions will both be leaving. I will be getting a new companion. He came out on the mission with me, and he's from South Carolina. Monday: It was preparation day and due to weather and mile shortages, we just stayed in Laurel. Then we had to be in by 6:00, so we got dinner and stayed in the rest of the night. Tuesday: We spent most of the day shoveling peoples walks and trying to talk to some people. Wednesday: We had district council, and then went on exchanges with Red Lodge. We spent most of the rest of the day in Columbus contacting. Thursday: We spent the day going around Red Lodge and trying to track down these people that we had on a list. We were able to find a couple of them, but one we couldn't find at all. Friday: We ended exchanges and switched back. Then we spent a lot of the rest of the day weekly planning. Saturday: We had a lesson in the morning, but it canceled. Then I had a prompting that we should knock on another door in the apartment complex, so we did. We ended up setting up a time to visit with him next week. Sunday: We went to the first ever two hour block of church ever. It was weird that sacrament meeting was a whole 15 minutes shorter, but only having one block after didn't trip me up too bad. Afterwards we went around to try and visit some referrals that we were given. That's all for this week. I hope you all have had a wonderful new year so far. Monday: It was preparation day and due to weather and mile shortages, we just stayed in Laurel. Or did he stay in Yanny? LOL. I sent him your question. ^ You see the second the 'thanks' button is gone, I suddenly become funny- just my luck. Monday: We spent the day down in Billings like normal. In the evening we had dinner with a person we are working with in Park City. He fed us hot wings. There were 3 different levels of wings, mild, buffalo, and hot. I worked my way up and was able to eat one of the hot wings, and it actually wasn't that bad. Then the Carolina Reaper sauce came out, and the 3 of them ate a glob of it on mild and buffalo wings. At first I wasn't going to eat it, but I tried a dab of the sauce and was fine. Then I got gutsy, and decided to "win" so I put a glob of the sauce on one of the hot wings. 2 painful minutes (which felt like 10), a chicken wing bone dipped in ranch, a glob of 5 cheese sticks stuck together, and a few glasses of milk later I had completed the extreme. Not the smartest thing I've done in my life, but I can say I ate the spiciest wing that night. Tuesday: I mostly hung around while my companions packed. In the evening we said goodbye to some people. Wednesday: Transfers have now been shifted back a day in order to incorporate a new transferring system with a charter bus ooowoowoo. Most of the day was more packing and more saying goodbyes. In the evening we went out the mission home and picked up my new companion. Thursday: In the morning we sent 2 other companions on their ways. We spent a good amount of the day weekly planning and getting Elder Martin acquainted with the area. Friday: We had the trainer call in the morning and then we had a meeting with our ward mission leader. Later that day we went around street contacting. Saturday: We had a couple of lessons in the morning, and then we spent the afternoon walking around town contacting some people. Sunday: We had church for the better part of the morning between both wards. In the afternoon we contacted people until dinner. After dinner we had a missionary work meeting with the youth at the bishop's house. It was nice. He went over the youth face to face President Nelson gave last spring. Monday: We did the normal preperation day thing, and spent the day in Billings. In the evening we contacted some people in town. Tuesday: We walked around town most of the day and contacted some people in our area book. Wednesday: We had interviews with our mission president which lasted a good amount of the day. After that we had a lesson which fell through, then we did some cleaning out of the areabook. Thursday: We had district council and then went on exchanges with the Zone Leaders. I stayed in Laurel. We went back to Laurel to go to a lesson. After the lesson we went back to Billings because we left the phone with my companion. We had dinner at Fuddruckers and then visited people on the way back to Laurel. Friday: We did a good amount of finding around town while on exchanges. We were able to talk to quite a few people, but nobody too promising. Saturday: We had two lessons in the morning but they both got canceled. We walked around town a lot through the neighborhoods and knocked on a bunch of doors. We had a few people let us in. Sunday: We went to church for the better part of the morning. After church we visited one of the Elders Quorum Presidents. Then we went to dinner. After dinner we had a fireside in town Billings that we went to. Thats about all for the week. This week we were in Walmart and just as we entered the very end of Wings's "Live And Let Die " played. Also for the past few weeks I have been spending Christmas money on Mondays to buy some records to send home. 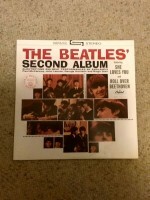 and I also picked up a copy of Beatles Second Album form a record store in Billings. Monday: It snowed decently for the first time this year. Now it's really looking like winter. We had a pretty normal preparation day. In the evening we had a lesson with a family in the ward. Tuesday: in the morning we went to seminary. Then we went and did service at the library in town. Later we had a lesson with one of our investigators. Thursday: In the morning we were supposed to help someone move in Joliet, but no one showed up. We spent a lot of the rest of the day street contacting in Red Lodge. In the evening we had a lesson with this kid. Friday: We went to a correlation meeting in Joliet and then ended exchanges. We spent the rest of the day doing weekly planning. Saturday: We had a real good lesson with one of our investigators. We were able to answer a good amount of his questions and clear up some of his concerns. After that we helped this lady move out, then talked to her a bit about the church. Sunday: We had Ward Conference in the Canyon Creek ward, so the whole service lasted 3 hours. Later we spent the afternoon contacting some people in the area book. In the evening we had dinner and were able to teach an investigator the family brought into the home. Thats all for this week. Have a good one! Also we were in Dairy Queen & I heard Love You To and Lady Madonna . Wish WSC happy birthday for me for the 4th RN! Will do, with pleasure, Holey. Luckily his birthday is his day on the Interweb and for receiving and sending emails. If anyone else wishes to send WSC birthday greetings let me know. His last birthday while he's on his Mission!!! Sending Fab Forum birthday greetings to WSC in around six hours, so last chance to be included. Today is my birthday. I turn 20 today! Monday: We went to Billings and did the normal preperation day thing. Tuesday: We did service at the library. Then we had a lesson on the other side of town. I the evening we contacted some people over by the refinery. Wednesday: We had district council in the morning. In the evening we were able to contact this referral we had. Thursday: We had a lesson in the morning, then a meeting with our ward mission leader in the Canyon Creek ward. Then we had a lesson down my the railroad tracks. Then we spent the rest of the day weekly planning. Friday: We mainly just contacted a bunch of people that were listed as focus people in the areabook. Saturday: We had 2 lessons in the morning. We went to one, but the second one canceled. We spent the rest of the day contacting focus people. Sunday: We went to church in the morning. In the afternoon we visited some less actives. Then we went and rededicated a house in Park City. Also thank you all for the birthday wishes. 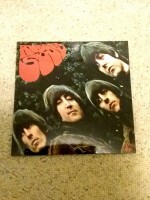 Speaking of, I got a sick Beatles Calendar for my birthday from the Red Lodge Elders. I also got this E Card from Father Shears Campbell today. Monday: It was my birthday and we went bowling as a zone. Tuesday: We went to the temple in the morning and then went to zone conference. Wednesday: We did service at the library and then we helped these people move. In the evening we had an activity with the youth where we played pickle ball. Thursday: Pretty normal day. We had a lesson and then contacted some people. Friday: We just did contacting for most of the day. We also did weekly planning. Saturday: We had 2 lessons. The first was with a less active. The second was with a guy that we've been meeting with for the last month who is really interested in the gospel. Sunday: We went to church. For the rest of the day we mainly contacted people. In the evening we did a blitz with the young men in Laurel ward. I hope you all have great week. This week we went shopping at Costco since one of the Red Lodge elders has a Costco card. We walked in and on the TV's there was Paul McCartney . It was him on this white background with a bunch of people in black around him with weird makeup on. It kinda looked like a music video, but the sound wasn't playing, so I'm not sure. I sent WSC an email letting him know about the Who Cares video. I imagine it was a shock. Transfer news is supposed to come today but it hasn't gotten here yet. I suppose you all will find out sometime. Monday: We did the normal preperation day thing. Spent the day in Billings and what not. Tuesday: We did service at the library, had a lesson with a guy we're working with, and did service at this thrift store thing. In the evening we went around and contacted some people. Wednesday: We had district council in the morning. Afterwards we went on exchanges with Red Lodge. I stayed in Laurel this time. We had a couple lessons in the evening. Thursday: We had a lesson in the afternoon, then in the evening at our dinner appointment we had a really good spiritual message given by the Elder I was with from Red Lodge. On our way back home we got a call from a private number who wanted to come to church on Sunday, so we have her the information. Friday: We knocked a few houses and then walked up and down main street a bit since it was a nice day(only 25 degrees F). We were able to talk to a few people. In the evening we had a lesson with the Red Lodge Elder's family over Skype. It was pretty neat. Saturday: We had a couple lessons in the afternoon. In the evening we contacted a few people in the north of town. Sunday: We went to churrch in the morning a usual. In the afternoon we visited this one less ctive lady who is doing nursing school online. In the evening we were able to get in with this family we are trying to get back to church. Friday: We knocked a few houses and then walked up and down main street a bit since it was a nice day(only 25 degrees F).